We are all familiar with the budget troubles facing cities today. School closures, transit cuts, and staff layoffs are all par for the course. The housing bubble burst sending the economy into a tailspin; people earned (and spent) less and cities were left without much needed tax revenue. Fortunately, some companies have found this situation to be the perfect time to expand their brand. How? By providing the necessary funding, and vetting process, for proposed solutions to issues facing communities, and promoting their own name in the process. Pepsi’s Refresh Project teamed up with GOOD Magazine to publicize the ideas it is receiving. The Refresh Project gives away US$1.3 million every month for what it calls “great ideas.” These range from bikes for a hundred tykes to theater rejuvenation to wishes-come-true for veterans. IBM has a similar initiative going on that you may have seen advertised recently: Smarter Cities. It is, of course, more focused on cities as a whole, rather than piecemeal ideas like the Refresh Project. IBM is working together with cities like Stockholm, Brisbane, Dublin, and Singapore on smarter transportation, and other cities on topics including smarter policing and emergency response, power and water management, and governance. They’re also collecting ideas from the general public through their Tumblr blog. See their promotional video here. 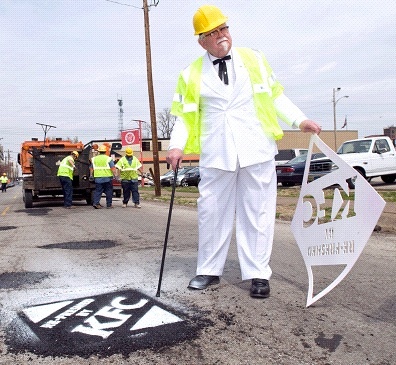 Lastly, KFC (of all companies) has been filling potholes for free in Louisville, Kentucky. They stamp each filled hole with the stenciled words “Re-Freshed by KFC.” Apparently, they’re campaigning to get a similar deal in at least 4 other cities. What do you think of the corporatizing of our city infrastructure and services?